9/7 & 8/2016: Absolutely loved our stay. Everything so comfy and cozy and breakfast was amazing- best on our trip so far- So glad we found you. Diane & Jeff Fort Collins, CO.
June 12 - 14th 2015 ; Probably the coolest B&B we have stayed at! Our friends will be so jealous. Next time we will have to go tree climbing for sure. I couldn't have asked for a cooler place to spend our two year anniversary! Sharena & Michael DelBrouco Denver, CO.
5/23/14 - This is our 2nd visit to Vertical Horizons. Always a thrill to stay in a treehouse. We love the tree that comes through the room in this one! Thank You! Christine, Olivia, and Audrey Eberle - Eugene, OR. 8/10/2014 - I Loved the treehouse it was awesome! The beds were super comfy and the chocolate you left us was delicous! -- Thank you! This was awesome. We really enjoyed our stay here. The treehouse was fun, breakfast was amazing, and the wildlife walking by every night was so cool! - The Crockett's - Rock Springs, Wyoming. October 2013 / Thank you for a unique experience in the trees. The treehouse is clean, homey, and comfortable. I especially was impressed with the attention to making us feel like we were at home- Coffee, teas,real plates and saucers, etc. Blankets were warm, fresh, and snuggling was so cozy! Breakfast- ohh we ate too much!! Nice touches in the bath house too. We will have great things to say about our experience at Vertical Horizons to our friends. Jim and Sheri Miller Lebanon, OR. 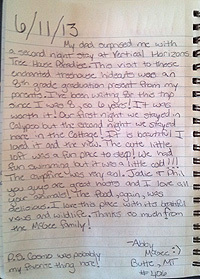 July 2011 - To the amazing crew at Vertical Horizons: We loved staying with you in the cozy Shiitake tree house this fall for our honeymoon. Not only was the treehouse a beautiful destination in itself, they were the perfect place to stay while exploring the area around them. Breakfast was off the hook every morning and was the perfect fuel for our adventures. Thank you for making our honeymoon truly a trip to remember. We look forward to staying with you in the future. 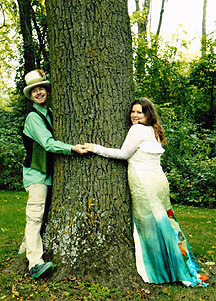 Peace, love, harmony- Tara and Charlie - PS It didn't take long for our wedding photographers to realize we are a couple of tree huggers. Thought you might enjoy this photo. June 2011 - I don't want to go... I don't want to goooo- Here we are regretfully spending our last morning on the deck of the Cottage! If only we could roll back time and start over! Thanks so much to all... Phil, Jodie, Roxie, Wendy, Adrian, Cosmo, Sadie and all others. We are renewed and ready to tackle the trip home. Hard to believe your breakfasts,,, we (mom too) ate, ate, and ate. Already trying to plan another visit up. Vertical Horizons will always have a spot in our hearts and minds. - The Franklin Family - Debbie, Patty, Tiny (mom) Until we meet again- God Bless. March 2011 - As if staying in a treehouse wasn't magical enough, our short stay here reached far beyond our expectations. Every little detail was appreciated. The only thing that we're bummed about is that we can't stay longer and explore more. But there will definitely be a next time and looking forward to many more times beyond that. Your sweet tree paradise will go highly recommend in our book. Thanks for everything and happy spring! - Kelly, Ryan and Iily - PS Ryan proposed to me last night and I can't think of a more perfect place for this sweet occasion! June 27 and 28 2011 - What an experience! Every family should do this. Family Time! My family couldn't have been happier. Such quiet- the tree houses were so clean and beautiful. We will tell everyone we can do a lot of advertising. Food was great. Tree climbing awesome! Thanks so much. Tony and Lywela Vale OK. - Worth every penny!! 7/20/10 - Phil and Jodie - You have thought of everything with your tree "oasis". All the fine details from the works of art, info. guide (with menus) games, activities and everything else around your home. We can tell you have put much thought into everything. Our stay here has put a permanent print in our minds and we will not forget it. Best of luck in the future.. Dave and Carol + 2 Omaha, Nebraska - P.S. Disc Golf course was killer! 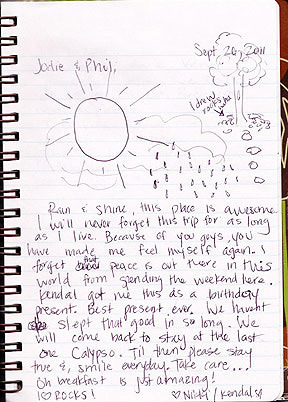 8/7/2010 - Phil and Jody - We truly enjoyed our stay in your little piece of paradise! We have spent the last 2 weeks "road tripping" up the CA/OR coast. We have done many activities along the way but this was one of the very best! The boys all said they wish we would have stayed here much longer (one of them even said they wish we would have stayed here the whole trip!) This was such a relaxing retreat for all of us! Everything was so much fun too. The horseshoe games, Disc golf, swinging, exploring, and staring at the amazing stars at night! (Don't miss that!) and the delicious breakfast. Thanks again for an awesome treehouse experience! - The West Family Jay, Kristi, Grant, Hayden, Hobie from Liberty, Missouri - Thanks to Cosmo too for being our protector through the night. 9/27/2010 - Thank you for a great experience. This was a surprise from my beautiful wife for my 40th Birthday. This trip will be a cherished memory for the rest of my life. Thank you Christy and Thank you Phil and Jody. - Dusty G. K. Falls. 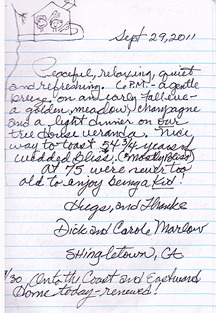 6/22/09 - Dear Jody and Phil, thank you for letting us stay at your tree house of paradise I think your tree houses are really nice! I think the shiitakes really awesome! I am so surprised that how high the house is! Also the beds are really comfy! I love how the house is set up, I like the ladder to the beds! I like that the windows are so clear, I didn't even know they were there! Sincerely, Ben Riggs age 10 your tree house lover. June 2009 BEST BIRTHDAY EVER! - It started off with a wonderful breakfast and then at night I loved going climbing with Jodie. Shes right, bubbles are 77 cents of pure joy! I love it here. Thank so much! Dayna (13 now!) and the Carlson family. - PS we loved Cosmo, Sadie, the cats and the horses. July 12th - 16th 2009 - Wicked! - Brilliant! - Epic! - we try to find one of a kind adventures to create awesome memories for and with our grand children- we had our 7 year old Riley here at Vertical Horizons Paradise- He was in heaven every minute! Last years trip to Kauai even came in 2nd to Phil and Jodies place! Perfect! - Superb! - Outstanding! - Thank You! - Pam, Clar, Riley- California! Sadie and Cosmo are the best! 7/30/09 - Great Experience even for us old gals! - Sistus Charlot and Jill. - P.S. we love the brown dog! Girls Weekend # 4 (Sing to the 'Beverly Hillbillies') - Let me tell you all a story about Jackie, shes our gal, - For 15 long years, she's been our confidante and pal. - So, to celebrate her 40th whatever do we buy? - How 'bout a crazy girls weekend, in a treehouse, in the sky? - Resort, that is, cabin, adventure! - well, the first thing you know we met the dogs and such until, - Austin and Jodie came around, but where the heck was Phil? - We got a tour and found our house, Shiitake was the best! - But how to get our stuff from the car up to our nest? - Long hike that is, steep path, heavy bags! - Adventure was our goal and adventures what we got! We zipped and climbed, boated and 'caved', shopped and ate a lot! - Enjoy your time, this place is great, we wish that we could stay, - fond memories will have to last 'till we come back and play! - Next year that is,... - Family vacation! - Jackie, Julie, Staci CA. Phil and Jodie 6-19-08 - I thought when my husband told me what we were doing that this was gong to be a working vacation. I couldn't have been more wrong! It took awhile to settle in, but it happened. Now I would love to stay longer. I love the walking sticks we made. My boys can keep them forever and remember staying in the 'Treehouse'. Thanks, K.C, Garrett, Grant, Gabriel, Valisha. 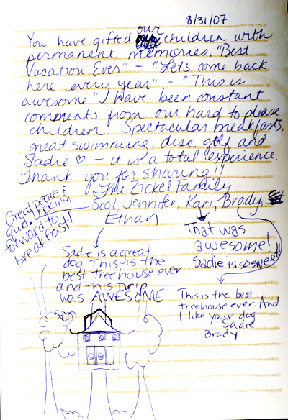 August 2008 - As our vacation is coming to an end, this is for sure one of the most awesome experiences we'll be talking about and remembering all the good moments I've spent in the 'Shiitake' and everything else you have going on for everyone to do. It is great to come to a place and everyone just doing things they like and enjoying the most. Our Son couldn't be happier picking up the fishing pole and spending hours out on the ponds. We all looked forward to your delicious and huge breakfasts, perfect for my kids (big kids) and us of course. We truly enjoyed the company of all of you including Cosmo and Sadie for hanging out with us. My daughter loved petting and playing with them. Phil, thanks for all the fishing tips you gave the boys. Jodie, Natalie and I enjoyed and learned things about rope climbing 'we had no idea about', "Good Luck" and all the best with your climbing. "OK!" you guys have a great place, thank you for making our stay so pleasant and welcoming. 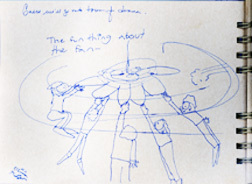 We hope to someday return and find its peacefulness, tranquility, friendliness and freedom. The Castillos Family CA. Phil and Jody, Cave exploring, Hell gate river tours, bike riding, fishing, hiking, Frisbee golf! and more all of these activities in such close proximity… and then to come back to such a beautiful setting at the end of each day, to a camp fire, s'mores, sunsets. This vacation truly lived up to our expectations and we all leave with lifetime memories!! Thank you for your hospitality, Mike, Julie, Jackson Jeffery and Joseph PS Breakfast was awesome!! June 9th, / Phil and Jodie, The Shiitake has been the experience of a lifetime for me, especially. Since I was a young girl reading Swiss Family Robinson, I have dreamed of living in a real tree house. I am 55 years old now and the closest I've come to an experience like this week has been my many visits to the 'Swiss Family Robinson Treehouse' in Walt Disney world. I've always loved it and have pretended that I lived there, even if only for 30 minutes. 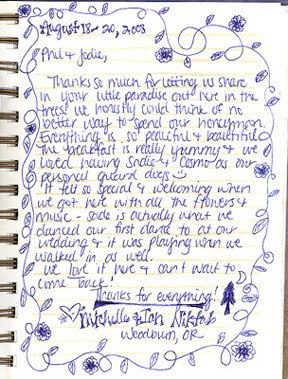 Really, Phil and Jodie, I'm in love with this tree house and the whole experience on your beautiful and expansive acreage. 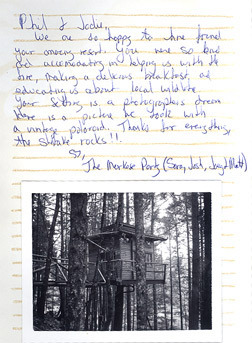 As if the tree house wasn't enough, your friendliness and wonderful hospitality have been beyond description. Breakfast has been delicious and exciting every day and the daily walks to Takilma Road very enjoyable. I can't wait to come back and will be dreaming of my tree house until then. Thank you! Love Marcy and Jerry Mandello, WPB, FL. 6/18/06 - Phil and Jodie, Breakfast was phenomenal! Our view was beautiful… Loved the seclusion (and the bathroom) Loft beds are comfortable and it was fun having a tree trunk right though the middle of everything- Thanks for building such an unusual "bed and breakfast" We had a great time! Good luck with "Rucifer" Sadie and the new hound. Must be fun to have so many animals. Steve, Tracy, Jared and Mike Fore Livermore, CA. July, 29th '05 / Had a wonderful time, the experience was indeed memorable. Enjoyed the peace and tranquility, and lazing about all day. Your hospitality and personal touches made the whole weekend wonderful. Will recommend to anybody to try. From the 'Canadians' Dawn Barnes, Terry Nichols, Carol Thompson, Richard Elder - "EH"
September 22, 2005 / (Joy) Were here to celebrate my husbands 60th birthday, we both needed this kind of peaceful, serene R and R. Beautiful treehouse, great hospitality! Haven't had breakfast yet but judging by everyone's comments we are so looking forward to it. Thank you for a wonderful get-away! (Tom) A really great time in a beautiful area. Your treehouses are a plan being carried out to perfection. Thanks for making it so special. Oh Yeah, the breakfast left me speechless. Incredible. Sincerely, Joy and Tom -Irvine, CA. September 2005 / Our long wait to get here is over, and now, so is our three day stay. The wait was worth it. We have enjoyed the whole experience. Time went by too quickly. Nick and Rachel enjoyed all the animals and seeing the deer pass through everyday. We probably should have done a few things in the area, but no one wanted to leave. Thanks for everything- The Arnett"s- Kent, WA. Our treehouses as kids were nothing like yours! This place is beautiful, peaceful; cozy; amazingly crafted, and so much fun. What a wonderful way to spend our belated 7th anniversary! Thanks to your warm hospitality, great company and deliciously prepared breakfast, we don't want to leave!! 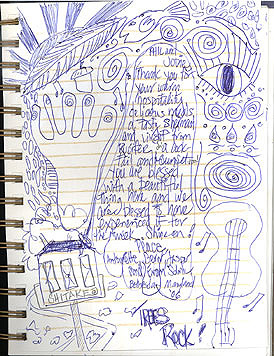 Looking forward to your new creations among the trees, Phil we plan on staying in each one. Thanks again Phil, Tara, and Jodie for a well needed getaway!